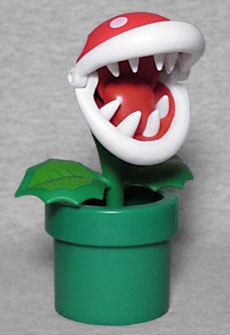 Though Mario encounters numerous dangerous enemies in his adventures, the carnivorous Piranha Plant is a common sight no matter where he travels. In the original Super Mario Bros. instruction manual, these little bitey bois were called "Pirana" Plants, but that was just a typo because "piranha" is a weird word to spell (thanks, Portuguese language). In Japan, it was known as a Pakkun Flower, with paku-paku being the sound of opening your mouth and taking big bites, and -kun being a cute diminutive; so the English equivalent would be calling them something like Snappy Shrubs. Or Bitey Bois. Piranha Plants initially appeared in SMB World 1-2, first hiding a secret coin room and then popping out to make sure Mario scoots up the staricase at the end. They were green there, with orange leaves - red ones first showed up in The Lost Levels, but this particular design, with a red bulb, green leaves, and white lips, was first seen in New Super Mario Bros. for the Ninento DS, and has since become the standard look for them. 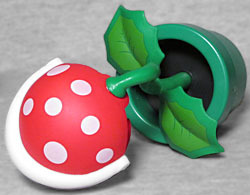 This toy, however, is definitely based on more recent sources: old Piranha Plants pointed straight up, while the stem on this one curves enough to let it look forward. Well, "make" it look forward; it's not like you have any option in the posing of it. There's a swivel for the head and another where the stem goes into the pipe... but why? Why would you need to swivel that? The pipe is fully symmetrical. It's a cylinder, they do that. If you want the plant to face a different direction, you can just turn the entire base, right? 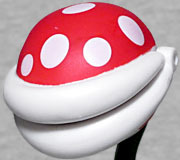 The one on the head is fine, because it allows for some personality, and the hinged mouth lets him snap at Mario or Luigi if they get too close. The leaves are a slightly lighter shade than the pipe, and they have highlights painted right in the center. The red bulb has 14 white spots painted on the outside, and the interior of the mouth (with its little sculpted tongue) is a little darker. The inside of the pipe is black, to suggest the shadows of its bottomless depth. This figure isn't technically part of the World of Nintendo line, instead coming in Super Mario-branded packaging. It still includes a bonus accessory, though: in this case, a question block. A fully sculpted question block, not just the cardboard versions seen with some of the figures, nor the perfectly smooth painted ones Bandai made. Shame there's no way to make it hover, though - you'll have to kick a Koopa shell at it if you want to unlock the secret that's inside. The Piranha Plant is a fun little piece of scenery (made even moreso thanks to a glitch in Target's computers that meant I got it for only $3), and will look great threatening your heroes.